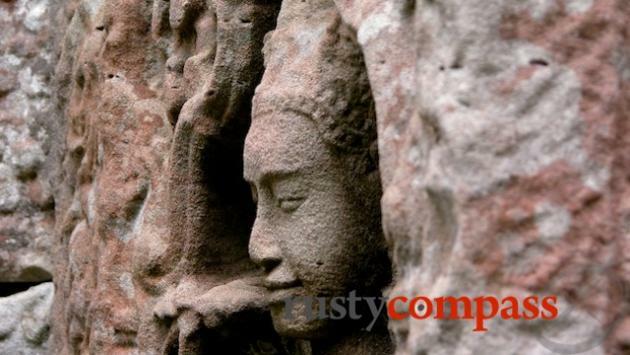 An independent travel guide to Siem Reap with candid reviews and recommendations. No sponsored content, no advertorial. Angkor then and now - a temple attendant. 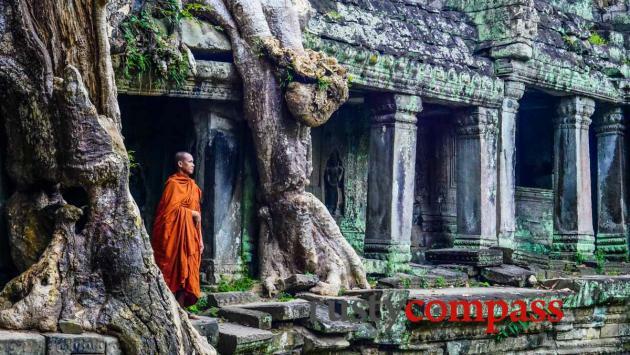 Two decades ago, Siem Reap was a small, dusty, provincial gateway to one of the greatest religious and architectural creations on earth - the temples of Angkor. The area had been a Khmer Rouge stronghold since the 1970s and attacks in and around the temples continued into the early 1990s. Siem Reap town was modest and depopulated. Emerging from decades of war and political turmoil. Only the most adventurous travellers made their way to the Angkor temples. As a long elusive peace finally descended on Cambodia, a trickle of travellers from around the globe began to return. Angkor had been a popular destination from the 1930s until the 1960s. The seeds of Siem Reap’s modern tourism boom were sown. In 2016, more than 2 million travellers visited the temples. I first visited Angkor Wat in 1994, when it was possible to spend a day climbing over the temples and encounter few if any other travellers. During the past decade, Siem Reap has been transformed by tourism. The town is booming. The population has swelled as new hotels, restaurants, bars, travel companies and a new airport have created thousands of new jobs. And it’s all thanks to the ruins of an ancient kingdom that did its major work 1000 years ago. While the tourism explosion has brought with it some expected downside, both the temples and the town are holding up well so far. The temples are spread over a vast area. While a handful of temples on the main tourist circuit can get busy - especially Angkor Wat - there are hundreds of temples spread across hundreds of kilometres. Many only see small numbers of travellers. On our most recent visit in late 2017, we found the temples busy, but we were pleasantly surpised at how easy it was to escape the crowds and enjoy a quiet moment at one of the most atmospheric places on earth. Take your time. Spend at least a few days exploring. If you like cycling, exploring the temples by bike is a delight. And don’t limit yourself to the most famous temples. Crowds often make these the least rewarding. Finally, keep in mind that the beauty of the Angkor temples is not just the temples. The lush forest setting is a big part of the appeal. And the centuries long struggle to reclaim the temples is the real magic of Angkor. Siem Reap is a great base for Angkor travels. The town has become a destination in its own right with superb hotels and resorts, a good dining scene, funky cafes and an easy small-town feel. The cool hotels and resorts cover all budgets. Stay a few days and break up your time at the temples relaxing in style. You can check out our recommendations here. The food scene in Siem Reap has also come a long way. There’s an excellent range of local and international restaurants. The cafe scene is flourishing too. You can check out our recommendations here. 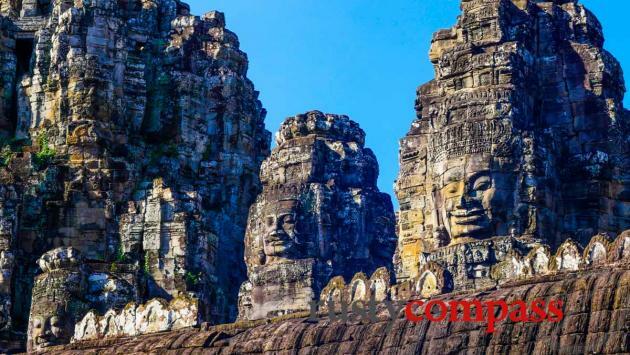 The temples of Angkor date from the Khmer kingdom that peaked between the 9th to the 13th century dominating modern day Cambodia as well as large tracts of Vietnam, Thailand and Laos. Their scale is vast. 12th century Angkor Wat may be the largest and best known but it’s just one of hundreds of temples strewn over hundreds of kilometres. A rich selection of temples can easily be accessed from Siem Reap; as always, it pays to travel beyond the standard temple tour. Siem Reap - the name means “victory over Siam” - was a tiny village when French explorer Henri Mouhot stumbled across the jungle encased Angkor ruins in 1860. Mouhot’s visit coincided with growing French colonial interest in Indochina. There are two frequently quoted passages from Mouhot’s travels that capture his profound appreciation of the grandeur of the temples and a mindset that would underpin the French colonial project in Indochina. "One of these temples—a rival to that of Solomon, and erected by some ancient Michael Angelo—might take an honourable place beside our most beautiful buildings. It is grander than anything left to us by Greece or Rome, and presents a sad contrast to the state of barbarism in which the nation is now plunged." "At Ongcor, there are ...ruins of such grandeur... that, at the first view, one is filled with profound admiration, and cannot but ask what has become of this powerful race, so civilized, so enlightened, the authors of these gigantic works?" Angkor had been discovered - at least by the West - though locals are thought to have worshipped continuously at the temples from the fall of the Khmer empire centuries before. The 1920s and 30s saw the first wave of temple-seeking European tourists arrive and inspired the construction of the Grand Hotel (the Raffles Grand d’Angkor these days) which opened in 1932. But World War II brought Cambodia’s first mini tourism boom to an abrupt hault. In the 50s and early 60s a new boom began as Angkor again became the travel destination of choice for the adventurous and the glamourous. And again, the boom proved to be shortlived. Jackie Kennedy’s 1967 visit coincided with the encroachment of the Vietnam War on Cambodian territory and the related rise of the Khmer Rouge. Her late husband's role in the critical early years of the Vietnam War must have given her pause for thought. By 1970, Cambodia was fighting to survive the spillover of war in Vietnam across its borders and a growing Khmer Rouge insurgency. Siem Reap and the Angkor temples fell into the hands of North Vietnamese communists. Darker days followed in 1975 with the Khmer Rouge seizure of power in Phnom Penh. Another tourism boom ended, Pol Pot’s reign of terror began, and Angkor disappeared from international view until peace returned to Cambodia more than twenty years later. Despite decades of war, looting and vandalism, not to mention centuries of grinding tension with the elements - what remains of the temples is breathtaking. Angkor’s third tourism boom has been the biggest and most enduring to date. While Siem Reap is fighting to retain its small town feel. But it remains a lovely place to pass time between temple expeditions. Its stunning boutique hotels, mellow tree lined streets, wonderful French era shophouses, as well as great food and shopping make it a near perfect complement to the temple experience. The best time to travel to Angkor? 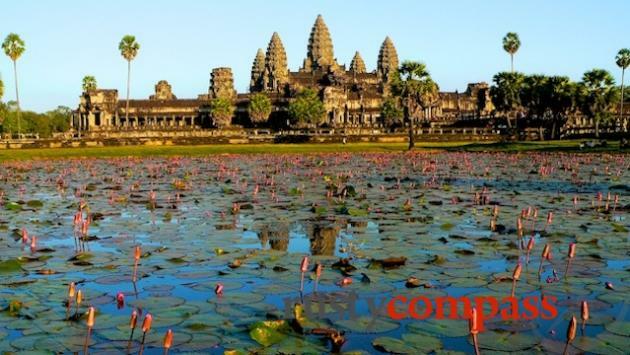 Our favourite months for travel to Angkor are between June and January. The rains fall from May or June and freshen everything up after the long hot dry. When it comes to travel to Angkor, rain is your friend and dust is your enemy. In the depths of the increasingly harsh dry seasons, the dust is oppressive. March to May are the hottest with average temperatures around 35 degrees. Averages fall 2 - 3 degrees between June and February. June to September are the wettest months but the rain usually lands in the form of a torrential storm rather days of non-stop drizzle. You’ll see sun most days. We think the rain adds to the beauty of the experience too. The image of dark clouds descending on the temples is especially dramatic. It’s good to try to avoid the busiest periods for tourist arrivals. The Christmas and New Year period are especially busy. Chinese New Year and Khmer New Year are also very busy. Cambodian public holidays are worth avoiding as well. Weekends will generally be busier as well - though this shouldn’t be a major issue. Siem Reap’s cosy little international airport is well served by flights from other major Asian cities and is the easiest and most popular route for international travellers. Some travellers - mainly backpackers - take the long and fairly arduous cross border road journey from Bangkok. If you’re already in country, Siem Reap is easily accessed by plane, road and boat services from Phnom Penh (boats operate in the wet season when river levels permit). Tourist visas are available on arrival at Siem Reap airport for 20USD. Bring a passport photo. Taxis and tuk-tuk's operate from the airport to the city centre and charge a fixed price of 7USD. Tuk tuks are also available for the 15 - 20 minute ride. The road journey from Bangkok makes sense only for those with lots of time, planning to travel extensively through Thailand and Cambodia. It’s been a notoriously scam riddled journey in the past but has improved lots - especially since the new road on the Cambodian leg was completed. The total trip takes between 7 - 10 hours and uses the border crossing known as Poipet / Aranyaprathet. Road travel to Siem Reap from Vietnam (Ho Chi Minh City) is possible via Phnom Penh. We’d definitely suggest you spend some time in Phnom Penh on the way through too. Phnom Penh can be reached from Ho Chi Minh in around 5 hours. Travel by road from Phnom Penh is easy and cheap and the road is in good shape. The journey takes around 5 -6 hours - only a couple of hours more than the flight by the time all of the airport variables are considered. There are some reasonable quality bus operators on the route and private cars can also easily be arranged in Phnom Penh. Avoid night buses. River travel between Phnom Penh and Siem Reap evokes a sense of romance that is quickly dispelled once you board the ferry. Unless you’re travelling on a longer cruise from Vietnam, the main ferries operating the 5 - 6 hour journey are of mediocre quality, not terribly safe and have a history of unreliability. It’s also important to remember that the service is most reliable in the wet season (June to November) and doesn’t operate during those months in the dry season when river clearance is insufficient. Getting around in Siem Reap and the Angkor temples is easy and part of the fun of being here. Walking around town is convenient and safe. Bicycles and tuk tuks are also good options both for getting around town and for travel to the temples. You can avoid car travel the entire time you’re here. There are even tuk tuks at the airport handling the short ride to town. Any temple visit is going to require plenty of time on your two feet. Angkor is a walker’s paradise. But you'll need some form of transport to get out to the temples and to get between them - bicycle, tuk tuk or car. Depending on your hotel, you may be able to cover off all your travels in compact Siem Reap town on foot as well. Otherwise, bicycles and tuk tuks can help you cover longer journeys. Committed cyclists can spend their entire Angkor / Siem Reap expedition on two wheels. Providing the humidity doesn’t bother you, the tree lined temple roads are shady, picturesque and in good shape. Traffic is usually fairly light though erratic drivers are a hazard. The main temples of Angkor Wat, the Bayon, Angkor Thom and Ta Prohm are in easy range of Siem Reap town. 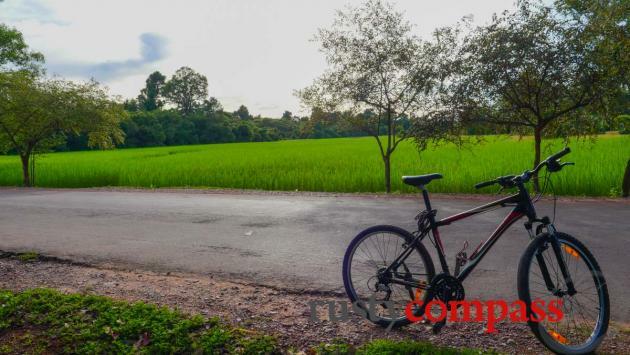 Check out our guide to cycling the Angkor Temples here. 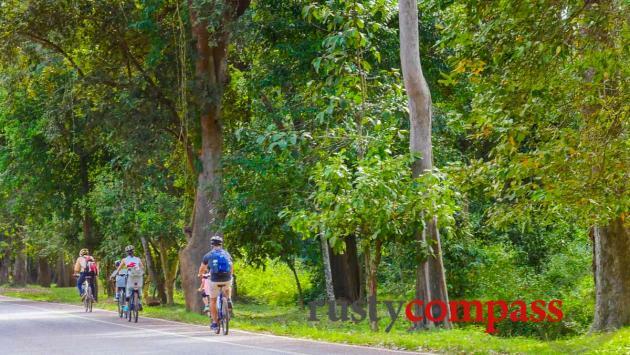 Cycling to Banteay Srei temple (around 30kms away), the Roluos Group temples and Lake Tonle Sap will require extra energy but will be no problem for experienced cyclists. Casual cyclists can also spend a pretty easy day cycling around the main temples from Siem Reap. Angkor Wat, Angkor Thom, Bayon, Ta Prohm and Preah Khan are only a few kilometres apart and are easily accessed by bike. Tuk tuks are also a great way to get around both the Angkor temples and Siem Reap town. Most tuk tuk drivers speak good English, are friendly and reliable. Avoid those that hassle too aggressively. Most hotels have a fleet of known tuk tuks that are usually reliable and accountable. Some hotels include a tuk tuk in their rates. A day at the temples will usually cost between US$12 and US$15. A further charge may be levied for travel to more distant temples such as Banteay Srei, the Roluos Group and Tonle Sap Lake. Car hire can be easily arranged by your hotel. Prices start from around US$35 per day. Siem Reap is a safe place for travellers. Common sense precautions that apply everywhere should see you enjoy a trouble free visit. Stomach upsets are more common but rarely serious. Petty crime such as bag snatching has arrived in Siem Reap but it’s rare. Travellers can reduce risk by dressing modestly, carrying only essential items and by avoiding leaving bags and cameras accessible when crossing streets and riding bicycles. Violent crime against travellers is rare in Siem Reap. There have naturally been incidents but given the volume of tourists passing through, these are not statistically significant. There are continuing problems with late night skirmishes between alcohol soaked young travellers on Pub St. Authorities have become increasingly sensitive to parties and other backpacker antics that they view to be an affront to Cambodian values. Stay sensible and remember you're in a country with different values to your own. A number of travellers use the wide availability of illicit drugs in Cambodia as an opportunity for experimentation. Penalties for illicit drug use are severe. A number of young travellers have died in Phnom Penh and other Cambodian cities in recent years as a result of experimentation with illicit drugs. Your biggest risk of being scammed is by a tuk tuk driver. From our experience though, tuk tuk drivers in Siem Reap are friendly and dependable and compare very favourably with their counterparts in Phnom Penh, Vietnam and Thailand. Making sure your hotel knows your tuk tuk driver is a good way of keeping them accountable. Be wary of people making strange offers anywhere. What sounds too good to be true normally is. Siem Reap’s roads are some of the most cycle friendly in the region but erratic drivers still pose some risk. Always keep your wits about you. Snakes and scorpions are occasionally spotted around the temples. Some of these are dangerous. Avoid any contact - even with small innocuous looking creatures. Landmines pose no noteworthy risk to travellers in the Siem Reap area. No travellers have been injured by landmines since Siem Reap opened its doors to international travel in the 1990s. Quite a few travellers experience an upset stomach while in Siem Reap and Cambodia. There is no fail-safe way of avoiding this but there are some good ways to minimise your exposure. * Only drink bottled water - and lots of it. The body needs lots of fluid in this climate. There may even be a case for using bottled water for brushing teeth. You can avoid plastic bottles in Siem Reap now too with a well established refilling system in place. * Stick to cooked foods. It’s a little tough as salads are definitely a tasty part of Khmer cuisine. * Avoid empty restaurants. Local restaurants with plenty of local patrons may look less hygienic but they’ll usually be a better bet than the empty pristine tourist places. Sexually transmitted diseases including AIDS, hepatitis and other illnesses are prevalent in Siem Reap. Siem Reap’s medical facilities remain well below international standard and travellers with serious conditions will need evacuation to Singapore of Bangkok. Siem Reap’s best medical facilities are listed here. They are both privately run. Royal Angkor International is Thai owned and has received good reviews despite high prices - it’s targeted at well healed or well insured travellers and very wealthy locals. Serious medical emergencies usually require evacuation to Bangkok or Singapore. Information for travellers to Siem Reap about ATMs, banking, money, internet, wifi, mobile and local media. There are plenty of banks and ATMs in Siem Reap making access to money very straightforward. International ATM charges are high. Local bank branches will levy a US$3 - US$4 local charge per transaction. Meanwhile, your account holding bank will likely levy further charges - often a US$3 charge as well as an additional 3% fee. It makes sense to keep a few hundred US dollars spare in case there are bank or credit card problems. Credit cards are very widely accepted at international hotels and large shops catering to tourists. They are less widely accepted at smaller hotels, shops and restaurants. Many local hotels will levy a 3% charge on credit card transactions. Many locally run hotels do not accept American Express or Diners cards. Internet access - usually free - is ubiquitous in Siem Reap. Most standard and budget hotels offer free WIFI. 3G and 4G SIM cards are cheap and widely available. Pick one up at the airport when you arrive. Data service quality is usually good. International calls from Cambodia are expensive from hotels, mobiles and landlines. Skype is recommended both for peer to peer and for all international calls.